I have followed closely the development of Google Android Phone since it has been announced. I even had two final year students working on their final year projects on mobile applications development with Android for almost a year. I have considered buying the Android Dev Phone 1 but unfortunately it is not being shipped to Malaysia. I continue to wait for any Android phone to be officially released in Malaysia and the day finally came. 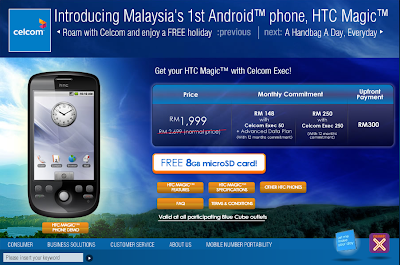 But when I saw the retail price of RM2699 (about $770) for the HTC Magic, I have decided to get one from eBay. 1. I have big thumbs and really would like to have a full QWERTY keyboard. I have get used to the QWERTY keyboard of my current Glofiish M700 Windows Mobile phone. 2. HTC Dream is a lot more cheaper. 3. It is the first generation phone and the same phone as the unlock Android Dev Phone 1 from Google, therefore the resources such as rooting, custom ROM etc. are more easily available and found. 4. The lack of video capture on G1 has been fixed with the Cupcake update. The lack of 3.5 mm headphone jack is now rectified by the bundling adapter. This is the first time I seriously bid on something on eBay. At that time, there were several G1 phones available on eBay and I have decided to get a white colour model. The first thing I looked for is a price that is lower than $399, the price of the Android Dev Phone 1. And then I looked for globally unlock phone (which at the end is not really necessary). Finally I checked the seller profile and found someone with 900+ feedback and a score greater than 98%. I checked some of the feedback to see how the seller response to buyers' questions and complains. After I have satisfied with everything including the product descriptions, the return policy and the Paypal payment method, I waited until the last minute to put in my first bid of $340 and finally got it at $345 (about RM1253). The final payment was $384.90 (RM1398) with shipping and insurance. Once the bid was confirmed, I paid right away with Credit Card through Paypal. 1. Everything is still in plastic cover except the phone. Since I am bidding for an unlocked phone, the seller must have been doing something with the phone. 2. The 1GB SD Card was already inserted into the phone and it was empty. 3. The screen protector was already applied but it was not a perfect job as there are annoying air bubbles found on the screen. 4. If the phone was turned on without SIM card, there is no warning of "no SIM card", obviously a result of the unlocked process. 5. I can start the activation process and a virtual keyboard is present to type, obviously the Android 1.5 Cupcake update was available. I then took out my Celcom (019) Prepaid SIM card from Glofiish M700 and inserted it into the G1 and turned on the phone again. I then tried to continue the activation process with my Gmail account and password. It failed since there is no data connection with the Internet. Then I discovered that I did not even have a GSM connection, I thought may be I need to add Access point name (APN) settings of Celcom. Beside the activation screen the only other screens I can access were the APN setup screen and the dial pad screen. I tried to add and edit the APN screen but every setting I key in can not be saved. I tried to get IMEI number in the dial pad screen by dialing *#06# and on the screen, only "IMEI" and [OK] button were there, it was like the G1 phone has no IMEI number at all. I became worry and emailed the seller for help and according to him the phone should just work after inserting any GSM SIM card. By the way, the seller has given me a few very fast responses. I have wondered whether or not the way the phone being unlocked causing the IMEI number not to be displayed and therefore the phone not recognized by the cell tower in Malaysia. I then try to search for a way to activate the phone without SIM card and I found these instructions from xda-developers forum. The only requirement to do that is that the phone has to be already rooted. According to Android-DLS Wiki: Rooting Android, only RC29 can be rooted and since my G1 already has Cupcake update it was definitely no longer stayed at RC29. So the only way I can get my G1 rooted was by downgrading it to RC29. I followed all the instructions of downgrade to RC29 very carefully since there is a possibility the G1 can be bricked (become a useless brick) if something get wrong. The obvious advices I followed is to make sure the phone battery is full before attempting the downgrade and all the files downloaded were complete by checking the md5sum. 1. There was a warning of SIM is locked, please insert a T-Mobile SIM card. 2. If no SIM card was inserted, the warning of "no SIM card" was present. 3. Pressing *#06# on the dial pad displayed the 15-digit IMEI number exactly the same as the one labeled on the box. I was actually quite happy with this as it means I have successfully reverted it back to a SIM-locked G1 and I know that G1 unlock code can be bought easily from the Internet as long as I have the IMEI number. That's the reason at the beginning of the post I said getting an unlock phone is really unnecessary since you are not sure whether it will work in your country. I went to this site and bought an unlock code for $23.00 (RM87.89). After I key in the unlock code, the phone automatically connected to Celcom right away without me doing anything. There is no need to edit APN setting for a connection to GSM cell tower as I think APN setting is only for GPRS/3G. Since the Celcom prepaid data rate of RM0.10 per 10 kilobyte is quite expensive I do not even want to add the GPRS/3G setting so that the phone can never connect using GPRS/3G. I have Wi-Fi connection at my office, my home and the usual place I have lunch, so Wi-Fi connection alone is enough for me. at the G1 keyboard (just open the hardware keyboard and type each character exactly, there is no feedback but the command is working at the background). After this step, adb (Android Debug Bridge) will be enabled on the phone. Setup on the PC can be found at Setting up a Device for Development. Follow the rest of the instructions to enable Wi-Fi and the phone was activated after the rest of the steps. Now the rooted phone was still at RC29, it was unsecured and I have to follow the instructions at Android-DLS Wiki: Keeping Root to update the phone to RC33 while keeping the root access. Once again I carefully make sure the phone battery is full and the files downloaded are complete. The process include using a modified recovery image and the JesusFreke's (JF) modified rom. After these step my G1 was now at RC33 but there was still no virtual keyboard and video capture. To get the Cupcake update, I opened the Android Market and searched for the application "JF Updater [FOR ROOTED PHONES]". I checked for update, downloaded and applied the update. Now I am a happy user of G1 Android phone with Celcom Prepaid SIM card. Good job for the rooting work and welcome to the club. I have been using T-Mobile G1 for nearly 9 months. Loving it every minute. And only now I started to see other people using this phone beside me in Malaysia. How great. Good post. Was there any problem with the package going through customs?